There are 20 million young people ages 16 – 24 working in the U.S., earning their first paychecks, often in summer youth employment programs. Many of these youth are growing up in financial deserts — communities without ready access to safe, quality financial tools and information. Years of failed urban policies have left these neighborhoods cut off from economic opportunity, with recent research showing that zip codes largely determine life chances in our country today. As a result, when youth from these neighborhoods take the critical step to secure a job, too many lose their hard-earned income to high-cost check cashers, and end up on a dead-end financial path. Emerging research shows that combining first employment experiences with access to quality financial tools and information builds youth savings and financial confidence, and puts them on a path to upward economic mobility. Yet, there is no system in place to ensure that low-income working youth have access to such pathways. Reaching youth with financial tools and information as they are starting their first jobs gives them a real shot at upward mobility, regardless of their zip code. This teachable moment—a first paycheck—offers a powerful touchpoint where access to banking, saving and credit-building are especially relevant and timely. A growing body of research has linked savings behavior to college completion, upward economic mobility more broadly, and improved confidence and future outlook. What’s more, reaching young people before and as they transition into adulthood can prevent the kinds of financial challenges facing so many adults in America today, such as damaged credit, unmanageable debt and lack of emergency savings. Because municipal youth employment programs connect millions of low-income youth to their first jobs, they offer a powerful delivery channel to combine financial tools and information with those first income streams toward making youth jobs not just about income, but about upward economic mobility. 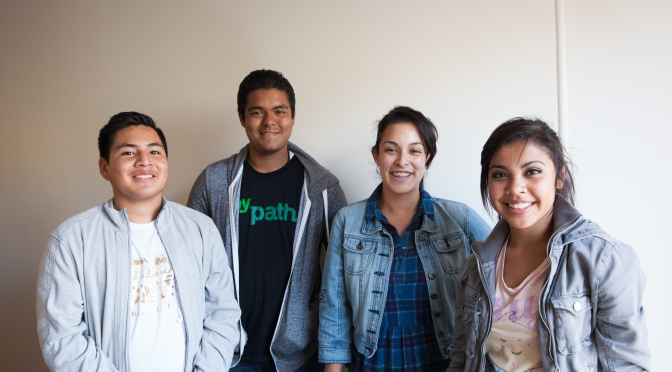 MyPath is a national nonprofit focused on paving economic pathways for low-income youth. MyPath helps cities and nonprofits “bake” banking, saving and credit-building tools and information directly into their existing youth employment programs to build local economic pathways. Our models leverage this teachable moment at the beginning of their financial lives to set the foundation for upward economic mobility, ultimately transforming their income into financial and personal growth. When we do this, we cultivate a stronger, more sustainable economy for generations to come. Engineering Effective Models: We design, test and scale models that support cities, youth employment programs and financial institutions to build economic pathways for youth. Our engineering process is rooted in our values of youth participation, the power of human relationships and technology, and ongoing data collection. Sharing What Works: Once proof of concept is established, MyPath shares best practices and evidence-based models through training and technical assistance to support the adoption of our approaches in communities. We support financial institutions to adapt their products for youth, and we support cities and nonprofits to integrate banking, goal-setting, saving and credit-building into their youth employment systems. We also disseminate our findings and lessons through White Papers and national conferences. Advancing Policy Change: MyPath engages youth and other stakeholders to advance policy and systems-level changes that will improve economic opportunities and financial pathways for low-income youth. For example, we advocate for regulatory changes to increase youth access to financial services and local policy changes to expand youth economic opportunity.